Webb’s AC anglers didn’t have the best of days over at Rookery Waters fishing the new Raven Pool, although match winner Ted Rowe was the exception to the rule. He romped home with 79lb 14oz, most taken on a small feeder with red maggot. Andy Perry took the runner-up spot with 22lb 10oz, again most falling to the feeder approach. Then it was Alan Forrest on 22lb 1oz and Colin Clarke completed the frame with 20lb 10oz. One of the biggest turnouts of the year saw a very strong field fishing the Saturday Rookery Waters Qualifying open which was spread over both the Jay and Magpie pools. 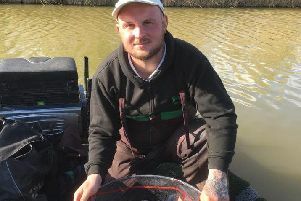 Spalding angler Dan Abbott took first place from peg 27 on Magpie. He started on banded pellet fished on the long pole shallow before switching to his two margin lines on his left-hand side with meat and maggots for a match-winning 150lb 5oz. He went home a very happy angler as he also scooped the £200 golden peg prize. Runner-up on Jay Lake was city rod Steve Freeman from peg 11. He alternated between meat and pellets in the edges and long to the far bank for 114lb 6oz. Third place went to Josh Pace on a level 96lb. Strong winds made presentation very difficult for the anglers fishing the Thursday £1,000 Qualifying Open on Jay Lake. First was Rob Wright with an all-meat catch of 176lb 12oz. Runner-up with 129lb 12oz was Simon Skelton, followed by Andrew Rayment in third place with a weight of 106lb 8oz.